At the end of last winter I made a pair of skis. I didn’t get hold of a camera before the snow disappeared so I waited with posting this until now. It’s only recently that I’ve really been able to test them much anyway. 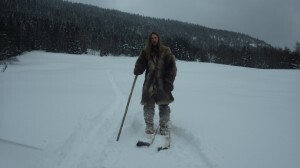 The project was inspired by various sources, for instance the video “Skiing in the shadows of Genghis Khan” and various literature on Siberian skis. As the snow usually has been loose all the way to the ground through the winter for the last decade, I decided to go for a design resting in between the long, but relatively narrow Altai skis and the very wide northern Siberian skis. The project started off with going off looking for a tree. We have some special places where the spruces grow limbless and straight grained. These were unfortunately not close by, so I decided on going for a tree that was slightly spirally grained, quite limbless and very big, probably in excess of 40 cm in width. A little on the choice of using spruce. Spruce is frequently used in the Altai and I know from experience that it is quite strong for it’s very light weight. It would wear out very quickly without skins underneath. But the addition of them removes the wear on the skis themselves. The weight of the skins makes it even more important for the skis themselves to be light. It is also one of the most abundant trees in the area. Lowland spruce was chosen, since the trees higher up are very dense and heavy and have a lot of limbs. As soon as I started felling the tree I was suspecting that this was a bad idea. It took a long time to fell, split and then hew down to size with an axe. I used a large felling axe for the felling and splitting, a tomahawk for hewing the logs into two large planks. This was done in January, while it was pretty cold on the site itself and I carried the planks inside a house to work them further. First one side was planed with the tomahawk to be fairly smooth and take out any natural twist in the grain. I didn’t have a planer and I had also decided to only use an axe, knife and bow drill for this project. When one side was good I hewed the wood to nearly correct thickness on the other side, leaving a bit more wood in the middle. Then I planed that side fairly smooth, drew the outline of the skis and cut it to shape. All this was done in the raw state and the I kept the planks buried in the snow whenever I was unable to work on them, like during my work periods. Next in line was bending the skis to skis. One of the reasons why I made the planks quite a bit thicker in the middle (nearly twice as thick) was that I didn’t want to have to bother with bending the middle to compensate for the weight of me standing on them during use. I made two jigs that I saw in the Altai movie. I heated the tips as I had seen in another movie; “Tracking the white reindeer” and bent them carefully. The skis were probably a bit on the thick side, since I got a bit of compression fractures on the upper side. The jigs were left on the skis for nearly 4 weeks while the skis dried under roof. When the jigs were removed, there was no popping back, the bend was exactly the same as I’ve tensioned them up into originally. For the bindings I drilled four holes and scored between the two semi-parallel holes to accommodate the softened moose rawhide for bindings. Rawhide is super strong and soaks up moisture more slowly than buckskin. Next time I’ll probably use buckskin or leather, since the rawhide is very difficult to knot well without wetting them first. During the first trial runs with my skis the bindings stretched a lot and came loose on my foot. Pre-stretch as much as possible before adding the bindings to the skis, otherwise you’ll be constantly adjusting them. With the bindings in place it was time to add the skins underneath. I used four large leg skins of moose, skinned quite far up the body to cover most of the length, another piece was added for the remainder at the bottom and additional pieces been sewn on the sides where the width was not sufficient. 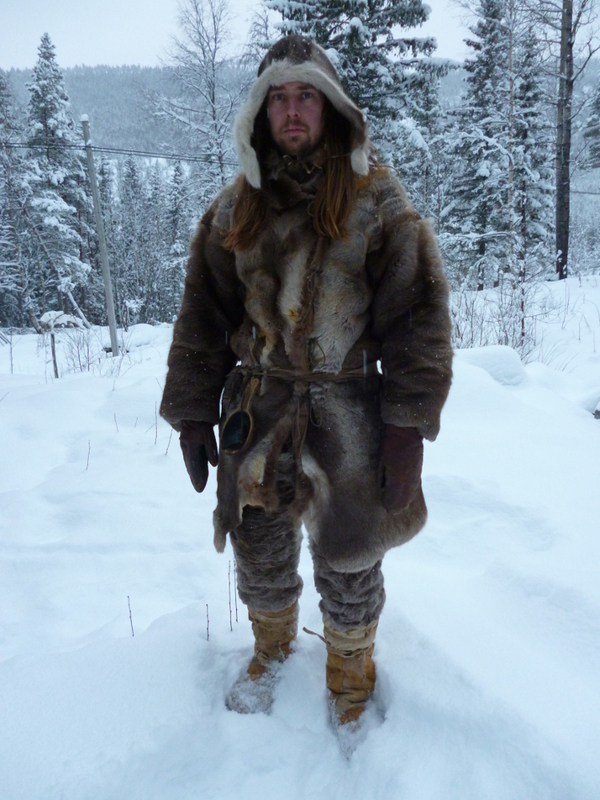 The skins were soaked for a couple of days in the river and sewn together wet with reindeer rawhide strips. This was quite a job and I’d prefer to not have to add the side pieces when I’m to do this again. I drilled holes along the entire length of the skis and stitched on top and between the wood and the skins on the underside to avoid the rawhide strings being worn out under the skis in use. The tips are more delicate and I decided to stitch across them instead, a method that worked out fine. Although I couldn’t resist using the skins very shortly after they were made, I afterwards let them season in the sun to dry the hide. This happened to be a bad idea, since the spring sun caused the wood to dry faster on the upper side than on the exposed skin side. This caused a light boat shape on the skis. Doing it again, I’d drop my impatience and dry them out of the sun, under roof. 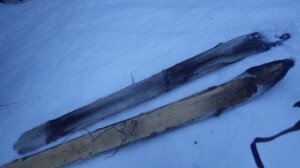 The seams underneath skis caused quite a bit of friction before the skins were properly dried. Now they’re just about right. I don’t want them too slippery. Uphill they work amazingly well, the skins makes you able to walk straight up the steepest slopes. They ended up a bit on the heavy side, being both very long and very broad, so next time ‘ll make them thinner. Another great advantage is that the skins, being naturally smooth in the hair direction makes any imperfections in the woodwork underneath become practically irrelevant. Also, even if the snow is wet, it will not stick underneath the skis as there has a great tendency of doing on wooden skis. On the downside the skis are difficult to use sideways because of the width. 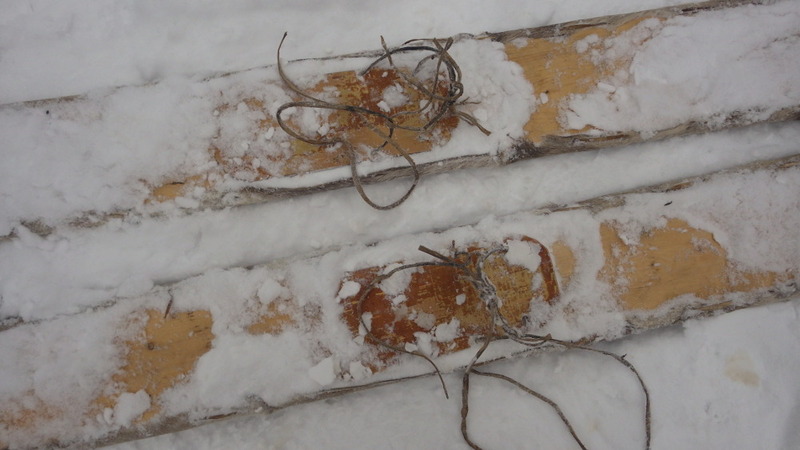 Also, the rawhide bindings stretches a lot and are difficult to tie properly to the foot, making for very tiring walking and very difficult downhill skiing. Snow will normally accumulate between the foot and the upper face of the ski, which can be a bit of a pain, but I added a sole of birch bark a few days ago, which removed the problem entirely. Now snow only sticks to the shoes which is equally problematic, but is easily remedied by making leg skin shoes with hair on the outside. All in all, I’m very pleased with the skis. The rawhide bindings is the only real problematic feature. Them being so broad I float almost on top regardless of conditions. Having skins underneath is a marvelous invention. I think the reason why they stopped doing that in Scandinavia (relatively recently), was because of a lack of skins rather than practical aspects. 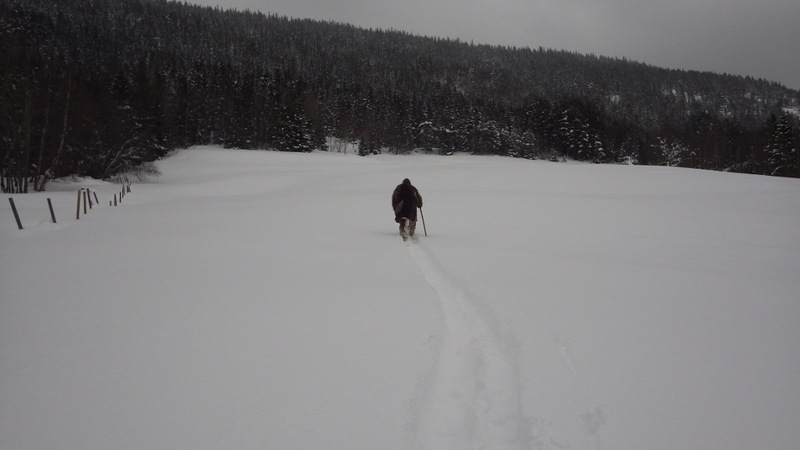 This area being characterized by very steep terrain, Canadian snowshoes are sometimes of limited usability, same with skis. The traditional snowshoes of Norway were usually made with a juniper frame and birch withies as webbing. 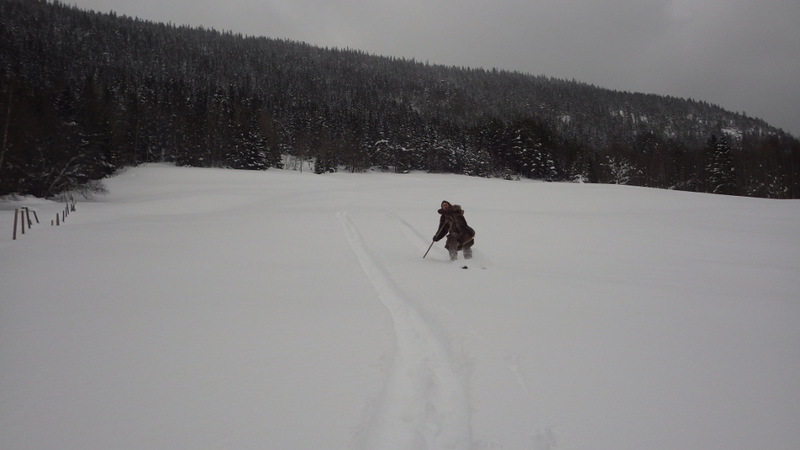 They don’t float nearly as well on the snow as the traditional skis used in the area being quite small and with very coarse webbing. In loose snow they don’t really help all that much, but when the snow is a bit denser or with a crust where your foot just about breaks through with each step they are perfect and make walking about a lot easier. Since these conditions frequently are quite wet, rawhide webbing would stretch a lot and become unusable. The withies are virtually unaffected by moisture and are very, very tough. I’ve never quite bothered making this kind of snowshoes before, because I assumed (without having tested) that juniper at this time of year is difficult to bend. Not so! Jonathan, who was visiting, gave it a go and it seems that this time of year is perfect for bending juniper. You can nearly bend it as far as you want without it cracking! 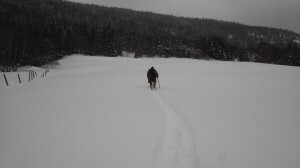 To be useful going uphill, the front toe has to be all the way to the front of the snowshoe. They’re fastened securely to your foot and doesn’t drop back like Canadian ones. 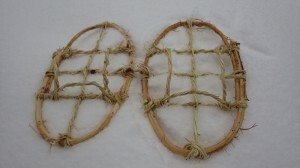 These snowshoes closely resemble native Californian snowshoes and probably a number of other very simple snowshoes. They are real survival equipment that can easily be made in a day even with stone tools. Jonathan will probably do a tutorial on how to make them soon, so check out his site in the time coming. 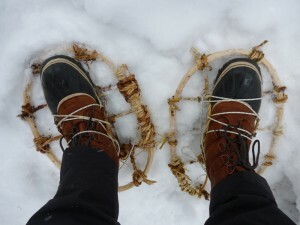 His snowshoes are the ones at the top, showing how they are attached to the foot. 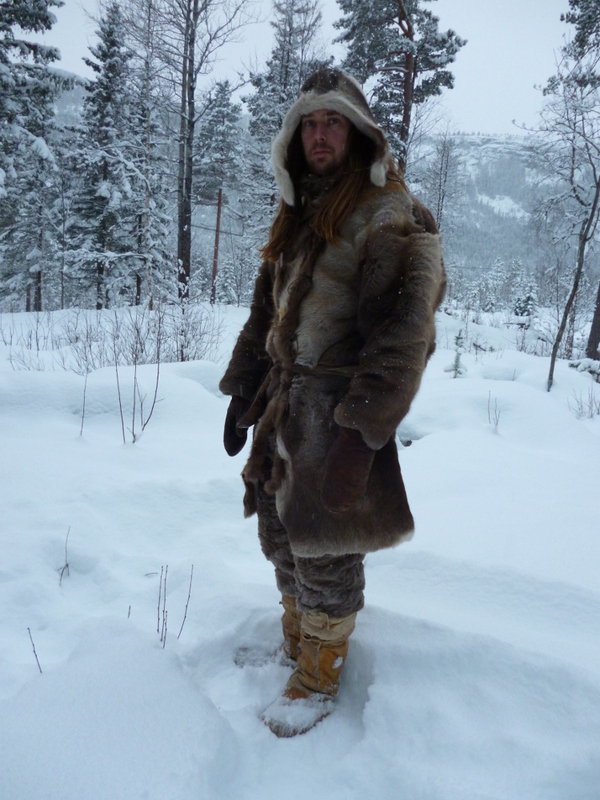 Thought I’d share some developments on my full winter clothing. I found I very rarely would need two layers of reindeer fur, so I decided to turn my inner coat into an outer coat. Very few modifications were made, but a collar with the fur turning inward were added around the neck to reduce draft. The coat is wild reindeer body fur. The hat wild reindeer belly fur. Early autumn killed. Around my neck there is a fox-tail fur collar. The outer mittens are bark tanned reindeer skin. The inner mittens; cropped winter fur of domesticated reindeer. Under the leggings, I’m wearing trousers of moose buckskin. 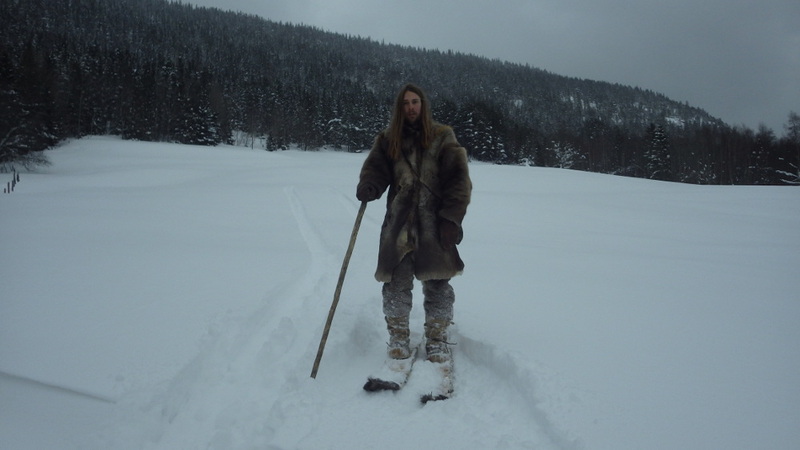 The leggings are of cropped winter fur of domesticated reindeer. The shoes were originally made as stockings out of cropped winter fur of domesticated reindeer, fur turned inwards. They work pretty well as shoes on their own, but I don’t like wearing hairless skin towards the snow, as the moisture absorbs so easily. New winter shoes of leg skins are in the works. 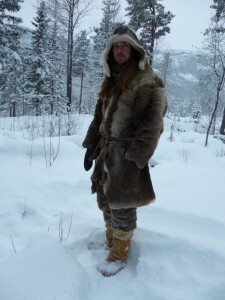 Additionally I’m going to make a light inner parka out of fox, marten and feral cat skins. And I’ll make a kilt, loincloth or breechcloth to wear with the fur leggings, possibly without the buckskin trousers. The inner mittens are becoming worn out so I probably have to make new ones soon and leg skin outer mittens is an additional priority.